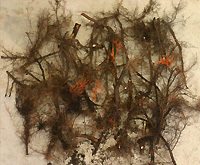 Roots growing over the root flare represent a severe root defect (left). 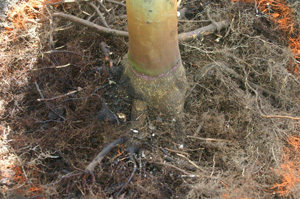 Pruning to remove roots that grow over the top of the buried root flare (center and right) improves the chances of the tree establishing without severe roots defects. Twelve minutes, on average, were required to remove these roots growing on top of the root flare of this maple that was planted deeply in the root ball. We have to plant trees at the correct depth in the nursery.